Nina is a mom of three boys living in Los Angeles, California. She is the author of several books, including the 5-star book, Parenting with Purpose: How to Prevent, Handle and Learn from Your Child’s Challenging Behavior. She was interviewed for the book, The Essential Habits Of 6-Figure Bloggers: Secrets of 17 Successful Bloggers You Can Use to Build a Six-Figure Online Business by Sally Miller, where she shares the story of how she grew her business. Nina was also invited to speak as a parenting expert on a webinar to the 100+ employees at CCS Fundraising where she talked about the challenges and solutions to life as a working mom. 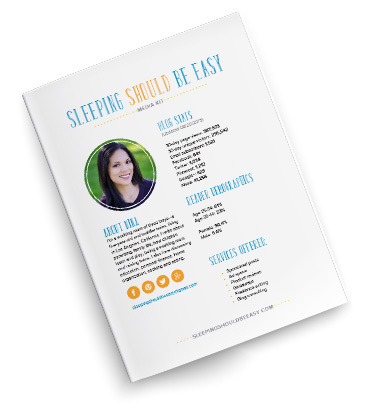 Sleeping Should Be Easy began in 2010 and is a go-to resource for moms to get tips and advice on all things parenting, family life, pregnancy, babies, working moms and early education. Nina also writes about food, budgeting, health and wellness. Sponsored content: Advertise your product, campaign or service in a full, personal post, complete with three images, social amplification and links to your website. Newsletter sponsorship: Advertise your product, campaign or service in a newsletter dedicated only to your company or brand. Product promotion: Promote your book, product, campaign or service on my social media platforms. Giveaways: Host a sweepstakes for your product or service. Giveaways are only available with sponsored posts, or on my weekly newsletter. “Nina, the article looks amazing and was very well written! We have seen an increase in traffic throughout today on our online media. We hope to work with you again in the future. You did an amazing job.”- Nicole K.
“I want to thank you for all of your hard work on this campaign! I’ve truly enjoyed reading through your touching content. The client is SUPER HAPPY with your work and they truly appreciate your fast turnaround.” – Vanessa V.
“It was a pleasure working with you. Thanks so much for your time and effort on this program.” – Amy A.
Download my media kit and contact me. I look forward to working with you!